Minneapolis Unveiling Plan To Counter Recruiting By ISIS : Parallels A million-dollar effort is being launched to help prevent radicalization of kids in Minneapolis' Somali community. But the plan is controversial, and some in that community feel unfairly singled out. 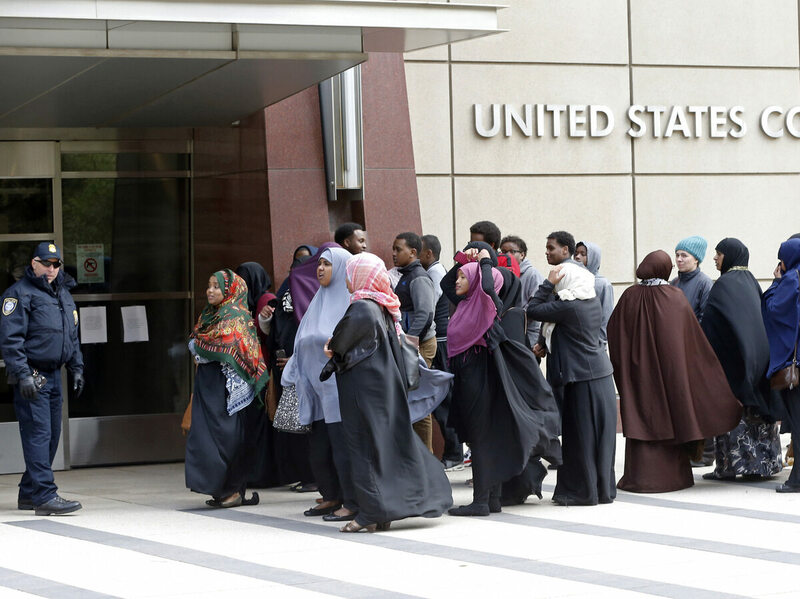 Members of the Minneapolis Somali community waited in May to enter the U.S. Courthouse where a federal judge ordered four Minnesota men, accused of trying to travel to Syria to join ISIS, to be held pending trial. Minneapolis officials are unveiling a million-dollar program aimed at preventing ISIS from radicalizing and recruiting Americans in the Twin Cities. The effort is in response to the fact that Minnesota's burgeoning Somali-American community — the largest in the U.S. at between 15,000 and 20,000 people — has become ground zero for ISIS's U.S. recruitment push. Law enforcement officials say between 50 and 60 young people in Minnesota have either successfully traveled to Syria, been stopped at an airport en route or are under investigation for allegedly planning to do so. Who Are America's Suspected ISIS Followers? Wednesday's announcement comes after more than a year of discussion and study aimed at finding ways to — in counterterrorism parlance — "counter violent extremism" or "build more resilient communities" in the Twin Cities. The new efforts are designed to identify the radicalization of children long before ISIS has persuaded them to board planes to take them to Syria. Minneapolis Somalis have been through this before. About seven years ago, the Somali terrorist group al-Shabab persuaded more than two dozen from their community to fly to Somalia to fight. As a result, Minneapolis Somalis have been asking for programs to help their at-risk kids for years. The threat of ISIS appears to have focused minds enough that lawmakers, foundations and local corporations finally found the money to respond. "The money has been received," says Minnesota's U.S. attorney, Andrew Luger, who is unveiling the plan. Among the initiatives: a Big Brothers Big Sisters Somali mentoring program, something the Twin Cities have never had before, and a program called "Opportunity Hub," which will help Somali youth put together resumes, learn how to interview for jobs and find new positions as they open up. While this might seem uncontroversial, there has been some criticism. For some members of the community, putting a program aimed at local Somali youth in the same breath as the words "violent extremism" has made them feel unfairly singled out. "The way the program was initially set up is already problematic," says Jaylani Hussein, the Somali-American executive director of the Council on American-Islamic Relations in Minnesota. "The fact that the only community that's being targeted by a federal program to address countering violent extremism is Somalis in Minnesota or Muslims in general across the nation, sets a [bad] precedent that is [a] very narrow view and [it] stigmatizes a community that is already getting backlash and pressure." Some Somali students in St. Cloud, Minn., reported that they were bullied and taunted by other students who said they were members of ISIS. Former U.S. Sen. Norm Coleman called Minnesota the "land of 10,000 terrorists" because it is identified with al-Shabab and ISIS travelers. Against that backdrop, Hussein says, "Now we have a federal prosecutor who is proposing to do more social service programs." Hussein says a U.S. attorney shouldn't be in the social services business. Luger appears to have heard him: A local nonprofit focused on teens, called Youthprise, is deciding how the grant money will be distributed and which programs will get funded. "We've reached out to Youthprise because of their familiarity with the community and their experience in working with the Somali community," says Luger. "They really will know best about where the money should go and how the money should be spent." The move could also provide some assurance to the Somali community that the new programs aren't intelligence operations in disguise. Luger said the U.S. attorney's office has signed a cooperative agreement with Youthprise that keeps law enforcement at arm's length. "This is not about law enforcement, this is about crime prevention, and it is about meeting the needs of the Somali community that were raised with us," Luger says. "I just had a meeting the other night with 30 Somali mothers who expressed a concern about radicalization in the teens in their families and others." The White House has chosen two other cities, Boston and Los Angeles, to set up pilot programs to address their own radicalization problems. But Minneapolis is the first to get a plan funded and off the ground.